DNA polymerase needs 3'-OH to add a dNTP. The chromosomes of prokaryotes are usually circular. 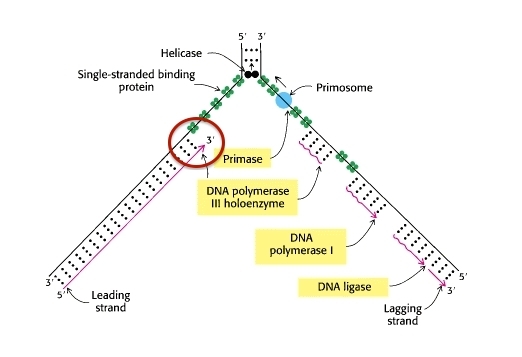 The primer in the leading strand (of course the primers in the lagging strand too) is removed by the 5'→3' exonuclease activity of DNA polymerase I. It makes sense that on the lagging strand the primers are removed and then replaced by new dNTPs using the 3'-OH of the previous Okazaki fragment. However, for the primer on the leading strand, there is no Okazaki fragment upstream and thus no 3'OH that DNA polymerase can use for polymerisation. How is the primer replaced by new dNTPs on leading strand? First consider the DNA replication fork after initiation has occurred. The 3′-OH primer on the leading strand is the 3′-end of the strand of DNA being synthesized in the 5′ to 3′ direction (cirlced in diagram below, modified from Berg, Biochemistry). It is not removed because there is no need to do so. 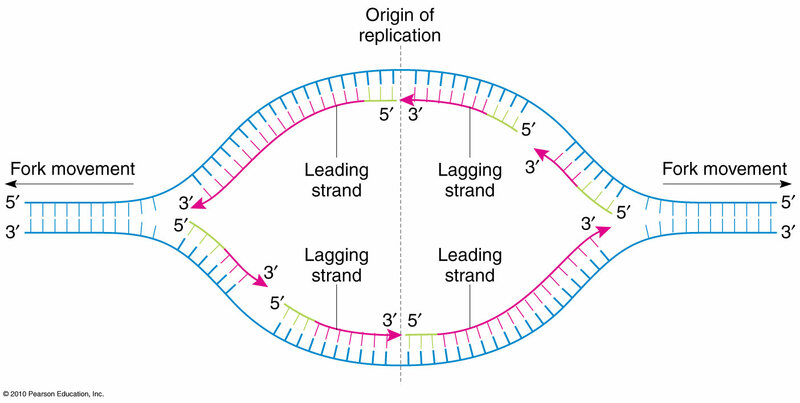 (The primer on the lagging strand is only removed because it is RNA.) So the problem posed in the question does not arise. Remember that the reason for Okazaki fragments is that there is no DNA 3'-OH primer for the lagging strand, so a temporary RNA 3′-OH primer is generated instead, RNA polymerase — unlike DNA polymerase — is able to copy DNA without a primer. There is no such problem for the leading strand. It can be seen that, at the origin, the 3′-OH of the DNA from the lagging strand of the other direction of replication (boxed in red) can act as a primer for the DNA synthesis function of DNA polymerase I, after its exonuclease activity as it removes a nucleotide from the start of the RNA primer on the leading strand. There was a typo in the original question which caused confusion about which strand the poster was concerned with. This answer assumes the leading strand. Not the answer you're looking for? Browse other questions tagged dna-replication primer or ask your own question. Does any specific property decide which DNA strand acts as leading strand template?